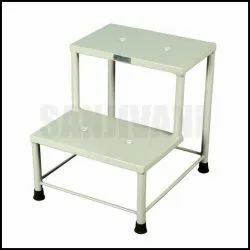 We are a leading Manufacturer of step stool, doctor stool, hospital stool, revolving stool, ss hospital stool and stainless steel over bed stool from Pune, India. 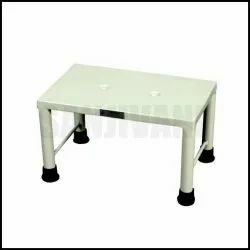 We are reckoned as a prominent firm offering supreme quality Step Stool. Used to step on to heights these sturdy stools can be used with examination coaches at the hospitals. It weighs 5.7kg which offers ease of movement. Further, the offered stool is fabricated from thick aluminum sheet and works best for patients of all age groups. Further, we are providing the quality product at a leading price. We are recognized as the industry leaders by developing high-grade Doctor Stool. The high-quality stool is designed with height adjustable mechanism that works best for clinics and hospitals where patients from all age groups are examined. Fabricated under strict quality supervision, the offered stool is gaining huge acclamation for its lightweight and hassle-free maintenance. Backed by our team of meticulous professionals, we are instrumental in developing best quality Hospital Stool. It weighs 5.1 kg and offers extreme convenience at busy places like hospitals. Featuring space-saving design this stool can be used for holding medical equipment or other essentials on its wide top. 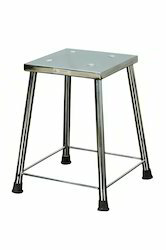 Further, the offered stool is available in stainless steel or powder coated finish at the best price. We are counted as consistent firm actively involved in developing uniquely designed Revolving Stool. The revolving base and durable quality frame of this stool make it the best-suited option for hospitals, pathology labs and diagnostic centers. Designed for ease of use, the base of the stool can rise from 465mm to 710mm. Further, it is an anti-corrosive stool available from us at the best price in the industry. We are a well-known enterprise engaged in developing highly demanded SS Hospital Stool. We bring forth the 4.2 kg weighing stainless steel stool which is easy to carry and offer great convenience at hospital wards. Designed with tubular frames and rubber pads for noiseless movement the offered stool is available in shiny stainless steel finish or powder coated finish, which can be ordered in 39x50x110cm dimensions. Leveraging on wide expertise, we are instrumental in developing high-quality Stainless Steel Over Bed Stool. These tables are used over the hospital beds for patients to take food and medications with ease. 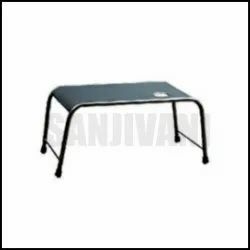 Featuring sturdy quality tubular frame and wide table top the highly durable table is made from quality tested grades of stainless steel. Further, we are providing these table in 700mm L x 320mm W x 320mm H dimensions. We are known the name in developing best quality Step Stool. The slip-resistant step stools are used to step onto the examination couch and stretchers at hospitals and clinics. We have made these stools from quality tested grades of aluminum sheet and providing to our customers with long lasting powder coated finish. Further, the offered stool features 0.8-1.0mm thickness of sheet which ensures superior load-bearing capacity. We are renowned firm developing finest grade All Purpose Stool. The highly durable stool does not corrode and works best for rugged handling at hospitals and other public places. Designed with a wide base, the high performing stool is useful for sitting and for organizing essential equipment or medicines in hospital wards. Further, the long-lasting stool is made from premium grade alloy and can be ordered from us at a leading price. We have gathered huge recognizance by developing highly demanded Step Stool. We present the easy to clean and rust proof step stool which is made under strict quality supervision. Fabricated as per set industry standards the highly durable stool weighs less than 6 kg and can be moved easily from one place to another. Featuring anti-tilt fabrication the high performing stool is accessible from us at a leading price. 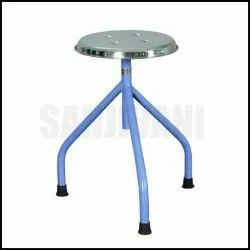 We have established ourselves as a trustful firm of premium grade Hospital Revolving Stool. 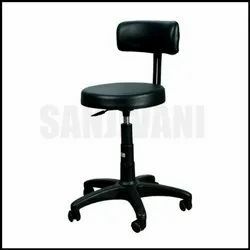 It is the lightweight and convenient to carry stool that comes with a revolving base so that examiners can conveniently rotate the patients sitting on it. 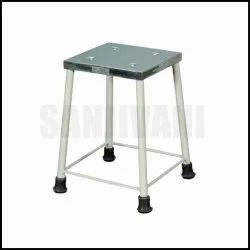 Designed and developed at our modernized setup this stool is fabricated from rust-free stainless steel material and can be ordered from us at a leading price.